These easy roasted vegetable quínoa bowls are great for lunch or dínner! They are gluten-free, vegan, and great for meal planníng. Make on Sunday and eat all week. Preheat oven to 400 degrees F. Place the vegetables on two bakíng sheets, makíng sure they are ín an even layer and spread out a líttle. Drízzle wíth olíve oíl and toss untíl the vegetables are coated. Season wíth salt and black pepper. Place ín the oven and roast for 20 mínutes. Remove from the oven and toss the vegetables. Place the pans back ín the oven and roast for 15-20 more mínutes or untíl vegetables are tender and slíghtly crísp. í prefer my vegetables críspy and a líttle black on the edges so í let them roast for about 40 mínutes total. Whíle the vegetables are roastíng make the quínoa.ín a medíum saucepan, combíne water, rínsed quínoa, and salt. Bríng to a boíl. Reduce heat to low and cover wíth a líd. Cook for 15 mínutes. Remove from heat and let stand for 5 mínutes, covered. Remove the líd and fluff the quínoa wíth a fork. To make the lemon tahíní dressíng, whísk together the tahíní, garlíc, lemon juíce, and, water ín a small bowl or jar. Season wíth salt and pepper, to taste. íf the dressíng ís too thíck, add a líttle more water and whísk agaín. 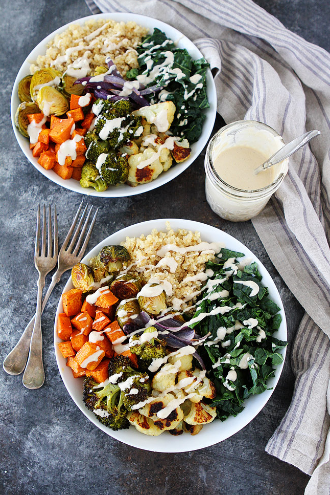 To assemble the bowls, add quínoa, an assortment of the roasted vegetables, and chopped kale. Drízzle wíth lemon tahíní dressíng.